Car Basics. Don't get stranded. Don't get ripped off. Get educated. Your Car 101 (Series) - Tint: Comparing Lifetime Warranties, Apples to Apples. Ah tint. After tinting for many many many years now, the market has proven to be competitive. The last question of most phone calls end in "...and does it come with the lifetime warranty?" The problem is, the average person does not understand that a lifetime warranty does not mean it's a quality tint. Tint shops generally do not tell you, it's a limited lifetime warranty and not an unlimited lifetime warranty, which is usually assumed. Here's where the fine print comes in. Limited lifetime warranty usually means that the warranty is only honored to the original purchaser of the product. In other words, if you buy a vehicle with a lifetime warranty tint, the warranty is not transferable and that warranty is null and void to you. You see, tint manufacturers are taking a risk. They are betting on you selling your vehicle before the tint encounters any issues. Some are taking a higher risk by using cheaper products. Some are not and use higher quality components. Sure, but your'e covered if you were the one that paid for the tint originally, right? Well, sure. But that's also depends on how the shop handles the situation. Most tint manufacturers will reimburse shops for the film, but not the labor to remove or re-install the new tint. Therefore, some shops may pass this extra expense on to you, the consumer. The other part of the warranty usually states it does not cover abuse, neglect, mishandling, or abuse of the film. That can be tricky and is open to loose interpretations by the tint manufacturer. 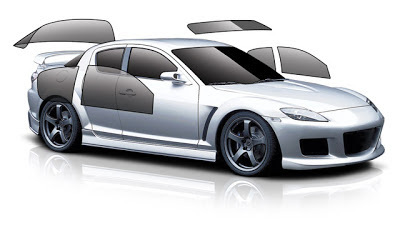 Also, some tint manufacturer have multiple lines of tint, each with its own set of warranty guidelines. Be sure to pick the one that meets your expectations. So the next time you shop around for tint, research not only the recommendations you're getting on the shop itself, but also on the brand and series of film they carry. You might find you aren't getting what your expecting. Your Car 101 (Series) - What does it mean when they say my vehicle has a misfire? If your car is running alone in almost a jerking motion, then you may hear from the mechanic that your car has a misfire. Or maybe you have a check engine code reader that is displaying Cylinder engine misfire. What does that truly mean? So basically, whether your car is a 3, 4, 6, or 8 cylinder (or more), there is a specific sequence in which each cylinder operates. Why? By alternating when the cylinders produce power, it allows the car to move forward in what feels like a seamless motion. Let's back up a bit and look at what happens in each cylinder. Each cylinder goes through 4 stages, also called a cycle in the car world. In the 1st cycle, the intake valve opens, and air enters the cylinder. Also, fuel is sprayed as a fine mist and the rod moves down to fill the cylinder. In the 2nd, the rod in a natural motion moves up, compressing the air and fuel mixture. In the third, the spark plug ignites the air/fuel mixture, shoving the rod down, and producing the power that moves the car. And lastly, the rod then moves back up, pushing the spent fuel out of the cylinder as the exhaust valve opens. All of these events have to work in the perfect sequence in all cylinders. If all cylinders ran at the same time, then your car would have 100% power during the third stage without any additional power until stage 3 came around again. Imagine sprinting for 1 minute and taking 3 minutes to slow to a stop then hit a full sprint again. That would be hard on your body, just as it would be bad for the car. Not to mention a very uncomfortable drive. The goal is to alternate the cylinders so that it would be closer to a 4 minute jogging period, evening the power throughout the drive. Now back to the misfire. When your issue is labeled as a misfire, one of the components caused the third stage to not happen. Either air or fuel or spark isn't making it into the cylinder. This could be caused by a number of things, including but not limited to a clogged fuel injector, bad spark plug, or even a severed spark plug wire. Through this, the mechanic can run through a process of elimination and isolate the problem at hand. Your Car 101 (Series) - Why is my steering wheel shaking? Steering Wheel Shaking? A few tips to hone in on the issue. There are several reasons why your steering wheel might be shaking. I hope these help you with your process of elimination. 1) Check your tie rod ends. These are the components at the ends of your steering rack. There is an inner and an outer. They are what's attached to your wheel components and have greased areas. If these are not properly greased and if the grease boot has busted or worn out, it can be the cause of our shake. Using a jack, lift up the a suspected corner. Inspect the black rubber section of the outer tie rod end (see image). These will typically make a noise if completely worn out. Best way to check is jack the corner of the car you suspect the issue to be on. Grab the wheel/tire. Rock the wheel side to side to see if there is any slack. Then rock the wheel top and bottom for the same. If you find slack in all 4 directions without steering wheel movement, it is most likely you need to replace your wheel bearing. Tires after some while, can sometimes throw off a weight. Hammer on weights tend to damange the wheels' surface, but are more likely to stay on the wheel than stick on weights. The best way to tell if your tire needs to be re-balanced is if the shaking in the steering wheel starts at a speed and approximately 10-15 mph later, it disappears. For example, you begin to feel a shake at 55mph. And as you pick up speed, then at 65 or 70, the shaking disappears. That would require a re-balance of the tires. Run your hand gently across the tread of the tires. Sometimes the tread starts to warp and no longer becomes a smooth surface. The tread becomes "choppy" or develops knots. This is sometimes due to manufacturers defect, but also with the overinflation of tires. Be sure to check your tire pressure regularly for not only optimum tire life, but optimum gas mileage. There are a few other culprits that can cause steering wheel shake. I will add them on this blog as they come to mind. But for now, these are very common sources of a wheel shake. It's that season. Rain. Sleet. Snow. Nature's finest precipitation. Milk, bread, and eggs disappear just as quickly as they hit the shelves. (Never understood why French Toast was so popular during these times.) What is it about the weather that scares people so much? Well...simple laws of physics and chemistry that can't be denied. Friction and molecular bonding to be more specific. I lost you didn't I? Let's back it up. The friction between the rubber tires and the pavement causes the car to move forward. Water molecules have a tendency to almost bond to one another which is one of it's cool properties because that allows it to transform into either gas, solid, or liquid. Back to cars, rain is scary for some because of the possibility of hydroplaning. Hydroplaning is like skipping a rock. At a certain speed, the tires of the car basically float on the surface, losing "friction" or what we call "traction" in the car world. Well, when we apply the brakes, the car takes advantage of friction again between the tires and the pavement to slow the car down. If the car is on the surface of water,...there's not as much friction between water and rubber as there is between pavement and rubber. The loss of friction is no different when it comes to ice. Sleet is like driving on a gravel surface, but can easily turn to ice if the conditions are right, so the ice rule applies with sleet as a precaution. The same with snow. So if you find yourself in rain, ice, sleet, or snow, here's 4 things to remember to make it manageable. Now, I know that's easier said than done. You're behind the wheel of the car that's headed straight for the telephone pole. You've found a patch of black ice, and your car is now spinning like a top down the interstate. The best thing to do is to stay as calm as possible. Sudden movements can make the situation worse, so make sure you're thinking clearly. 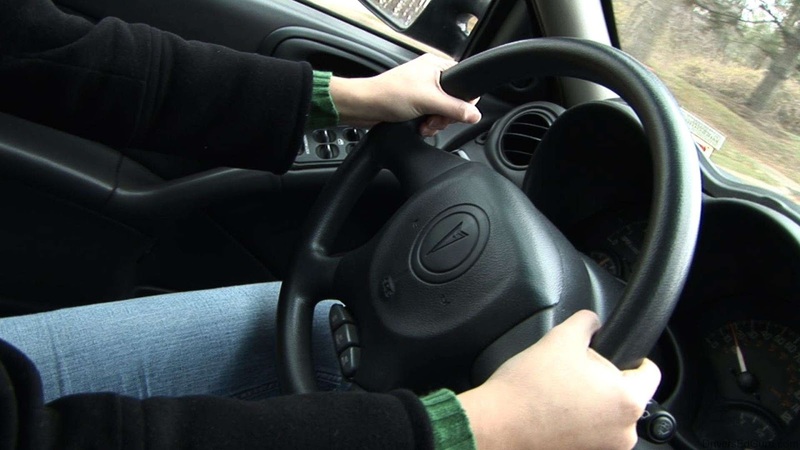 A sudden jerk of the steering wheel could change your direction from heading into a ditch to flipping end over end. Rain: If the rock you're trying to skip is moving slower, it will sink faster. Same concept with your tires. Slowing down prevents the tires from "floating" and keeps them on the pavement. It's probably good to note here that bald tires "float" better. It's like finding that perfect skipping rock. Sleet / Snow / Ice: Walking on ice is entirely possible if careful. You wouldn't try to run on ice. Well...at least without knowing there's a really good chance of losing balance and falling. (You do have rubber on the bottom of your tennis shoes.) The nice thing about ice is you will continue to move in the direction you are headed should you hit a patch, so keeping on the road isn't a problem. (This is actually Newton's first law of motion.) It's when heading towards a turn, a red light, or stopped traffic that becomes tricky. Give yourself plenty of room and slow down a lot earlier. 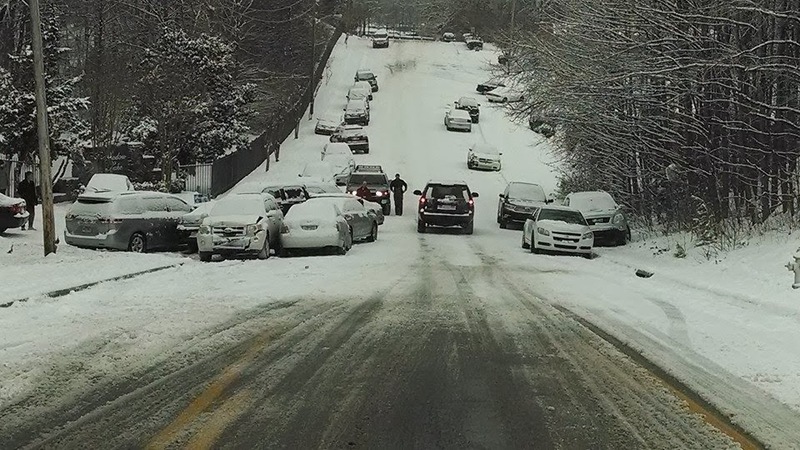 Rain / Sleet / Snow / Ice: If you get caught in an unfortunate situation, know where you are compared to your surroundings. Are you driving in a hilly area, is there a ledge, etc... You can then try to steer the vehicle towards a safe area. Rain / Sleet / Snow / Ice: Tap the brakes. Holding the brake down does nothing for you when you're already sliding. (Unless you have ABS - Anti-lock Braking System. If you're unsure if you have it, read on.) Tapping the brakes gives a "friction, no friction, friction, no friction" and even though the friction is slight, it'll help slow you down with each tap. How quickly depends on a lot of factors: condition of the tires, if the ice is smooth or lumpy, etc... (Newton's third law of motion.) It's a habit to just floor the brake because that works in dry conditions. The best rule of thumb is to not travel in conditions you aren't comfortable with. However, if you have to or are unexpectedly caught in it, I hope this helps. Disclaimer: This blog is written as merely a source of understanding and knowledge to serve as a guide should you get into a situation. This by no means is a 100% rule of thumb and to make you feel you can manage any driving condition. I'm sure we've all been caught in a situation where we've unexpectantly had a flat tire. It can be a scary scenario, but if you're one of the many that do not have roadside assistance, it might be time to get dirty. Changing a flat tire is different when we are talking about a car or a truck, so consider this article as more of a general guide. Some vehicles are equipped with full size spares. What that means is that the spare is the exact same size (height and width) as the other four on the vehicle. Others are equipped with a spare in which are significantly smaller than what's on the vehicle. Keep in mind that these types of spares are ONLY to be used to get from where you are to your final destination. Most are not recommended to be driven more than 100 miles and are not to be considered a replacement or to carry you through a long trip. If there's one thing I remember from my childhood, it's the Boy Scout Motto: "Be Prepared". Make sure you have the proper tools to change your tire. [ ] Spare tire. Surprisingly more cars these days are not coming with a spare tire but with a tire inflator. If you fall in this bracket, visit your local tire shop where you could purchase a wheel and tire combo as your spare. They can make sure you have a wheel with the proper offset and bolt pattern that fits your vehicle. (I'll define these in another article.) Chances are that a full size spare will not fit in your vehicle without taking additional trunk space. If you're not comfortable with that, find a tire option that will fit and still serve its purpose. 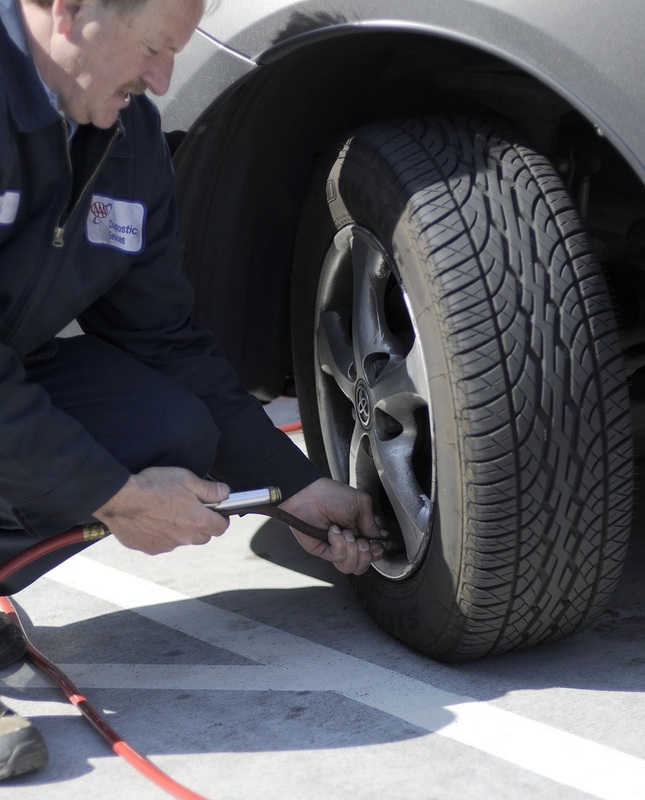 A tire inflator will not help if your flat is due to a puncture in the tire. [ ] Jack and Lug nut wrench. Most cars do come equipped with this. However, if you've bought your vehicle used, these items are sometimes missing. You can purchase any of these at your local auto parts store. If this is included in your car, check your owner's manual for where the car manufacturer put it. Possible locations for a car include under the mat in the trunk, in a side pocket of the trunk. Possible locations for a truck include under or behind the rear seats. [ ] Owner's manual. If you bought your vehicle used, you might find this missing also. No worries. The car manufacturer's dealership can sell you a replacement. Or, these can usually be bought on eBay or various places for a pretty cheap price. [ ] Flashlight. You never know when a good flashlight will come in handy. Be sure to check the batteries regularly! [ ] Gloves. If you're someone who is normally dressed for an office environment, you may not be properly dressed for a nasty tire change. Gloves won't keep your clothes clean, but they'll help you from transferring any dirt from your hands to your clothes when you get back behind the wheel. Now that you have all the proper equipment, let's give it a shot. Go ahead and practice at least once. They say practice makes perfect. So what do you do? 1) Pull off to the right shoulder of the road. Turn on your hazards. Safety first! This lets the other drivers know there's a car on the side of the road. If the flat tire is on the driver's side, move as far right as possible. 2) Get out your spare tire and tools. Do this from the passenger side (away from moving traffic) if you can. Get those gloves on. 3) Use your lug nut wrench and break the lug nuts loose. Here's where my other blog: Beware of the impact wrench can be helpful. By using the tire's friction against the ground, it'll help you to break loose the lug nuts. The lug nuts should be on pretty tight. What a sight it would be to see your wheel to pass by while you're driving! However, they should not have been tightened so much that you cannot undo the lug nuts even by jumping on the wrench. 4) Once all the lug nuts have been loosened up, jack up the vehicle. Cars and trucks have different jacking points, so seek your owner's manual to where your proper locations are. If it's a car, you'll find the jacking point just under the doors of the vehicle. There will be a sheet of metal under the car called the pinch weld. You will find either two notches cut out on the ends closest to the tires or a cutout. (See image.) The jack should touch between the notches or where the cutout is. If you have a truck, you will be jacking up near the suspension of the vehicle. Sometimes it's a plate just under the shock. 5) Remove the lug nuts the remainder of the way off the wheel studs. Remove the wheel with the flat tire. Now, keep in mind, your tire is flat, and you have just jacked the car high enough to remove it. Here you'll have to test fit the spare tire and jack the car up as necessary to place the spare on. 6) Once your spare is on, start threading the lug nuts back on the car. When you do this spin your tire (if it'll spin). This will help you center the spare. If not, wiggle the spare as you tighten down the lug nuts. At this point the lug nuts should on be "hand tight". No tools are to be used. 7) Get your lug nut wrench and tighten the lug nuts snug. See the image for the pattern you should follow. You do this because it helps make sure that as you're tightening more, the wheel is truly centered. If it's off centered, the spare won't rotate in a circle, and it could ruin the wheel studs. 8) Check to make sure nothing is left under the car and slowly let the jack down. 9) Yay! Your car is back on the ground. While on the ground, re-tighten the lug nuts with your lug nut wrench just to make sure they're on nice and tight. If you do not have a full size spare, drive slowly. You don't want to drive too terribly fast and some of the spare tires will have the max speed written on the side of the tire. This is for your safety so please follow these. A flat tire situation is never exciting. However, being prepared for it can make it less painless. Be safe! Dyed, Metalized, Hybrid and Ceramic Window Film. What's Best? Each of the four types of film is named because of the primary component used to protect you and your car. With so many options, which do you choose? There are a lot of benefits to using window tinting; glare reduction, heat protection, fade protection, U.V. protection, safety, aesthetics, privacy. You will have to decide, what you are wanting your window tint to do. Window tinting is simply adding a layer of UV treated optical grade polyester film. That film can be manufactured in several ways, not just in the components mentioned in this article, but more specifically how it is made. This type of window tinting relies on the absorbing properties of the dye to keep your car cool. Because it does not contain any metal it gives your automobile the blackest look and does not have any "sheen" to it. This film rejects the least amount of heat and is mainly used for its appearance. It does reduce glare, and reduces fading to interior upholstery. This film is a good product for customers that desire crisp appearance, heat reduction, glare reduction, fade protection, and UV protection. Metalized window film are either all metal or have a single layer of ceramics. Metalized window tinting is very good at reducing heat and reflecting UV rays. However, they are very shiny and can cause interference with radio, GPS, TPMS (Tire Pressure Monitoring System) sensors, and cell phones. Its shade and color are mainly determined by the type of metal used to make it. Metalized window film's purpose is to reflect. These are rarely used anymore after the introduction of the TPMS. Hybrid films use a combination of a dyed layer as well as a metalized layer. Using Hybrid window tint offers the best of both worlds. A metal layer is used for its reflective qualities and a dyed layer is used for its absorptive qualities. Because not a lot of metal is used by some manufacturers, these are the best bang for the buck as they don't block any of the signals the 100% metalized films do. The fourth and final type of window tinting is ceramic. Absorbing twice as much heat as dyed or hybrid films, it is considered to be the most technologically advanced type of window tinting. It is capable of high heat absorption at relatively light shades. It is definitely the ultimate in heat reduction; however, the cost is almost twice that of Hybrid films. This film is optimal for customers desiring a highly durable material, with excellent clarity, and providing superior heat reduction versus other film choices. It's easy to think that all lifetime warranty films are alike. Many get caught up in the trap of comparing pricing rather than the film quality. Be careful. Some companies may install the dyed film rather than the hybrid, selling it at a lower price but actually making a higher profit. Also, note thicker film may take up to weeks longer to dry out than other film choices. Ultimately, it comes down to the purpose for getting your windows tinted. A: Checking the tire pressure isn't a very difficult task. However, It is important to check in on a regular basis. Air is comprised of my particles. Air expands and contracts with temperatures - expands with heat, condenses with cold. So you will find many times that when fall/winter comes, your tire pressure decreases, and just as spring/summer hits, your tire pressure increases. Accurate tire pressures can affect several things. Improper maintenance of your tire pressure can decrease your tire's life. Too little air pressure causes more tire to contact the pavement but also puts the tire in a pinch between the surface and the wheel. This creates almost a rubbing effect where each bump pinches the tire and wears away at the inside surface. Eventually...this could cause the tire to pop while driving. However you look at it, if your tire's air pressure is low, you're decreasing the life of your tire. Two, improper maintenance of tire pressure can affect the car's gas mileage. Crazy, huh? Well, think of it this way. Too little air pressure creates excess rubber to contact the road, creating a larger area of friction or resistance. The car has to work harder on each rotation to push/pull (depending on how you imagine it) the car. Have you ever tried pushing a wheel barrel with a low tire? Your car feels the same way. According to FuelEconomy.Gov, "under inflated tires can lower gas mileage by 0.3 percent for every 1 psi drop in pressure of all four tires." That's huge considering you could gain almost 4% better fuel economy by just maintaining your tire pressure. If you're unsure where your tire pressure should be, don't fret. Car manufacturer's tell you! Open the driver's door and look at the door jam. Somewhere close to the door latch on either the body of the car or the door, you will find a sticker with tire sizes and the recommended tire pressures. Sometimes, they will also tell you recommended pressures during hot and cold weather seasons. If it's not in your door jam, other locations include the glove box, trunk, center console, or the owner's manual (if you have one). Don't know how to check it? Well...there's no reason for me to reinvent the wheel. The DMV offers a very good instructional page, including what I was going to recommend - do NOT buy the cheapo tire pressure gauges. DMV Webpage.